Zomato was started in 2008 by two Indian entrepreneurs and currently operates in 23 countries. Zomato provides information and reviews on restaurants. 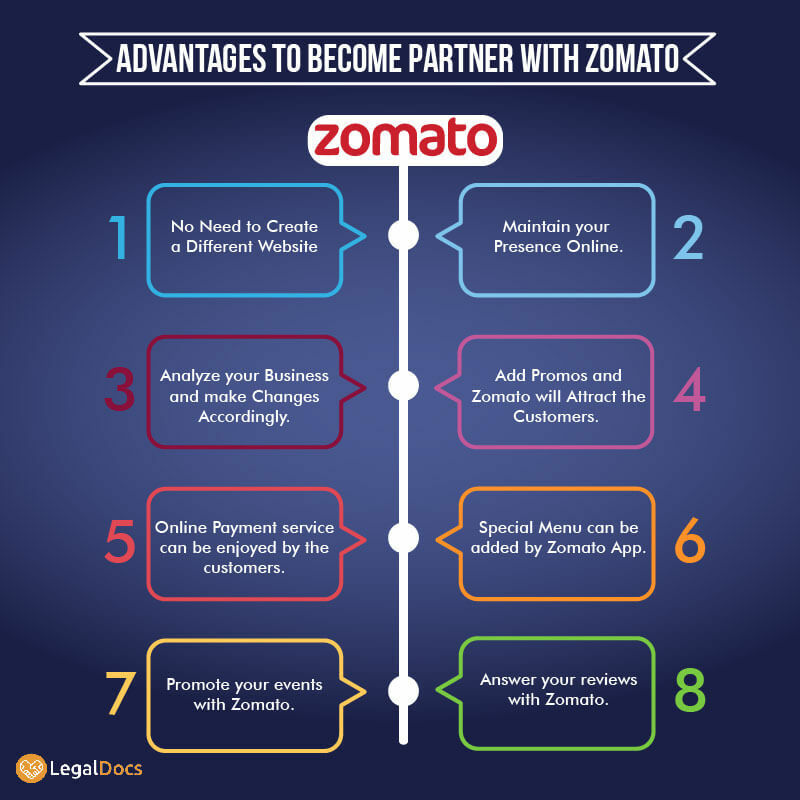 Zomato is a prominent player in this industry for quite some time now.If you have a restaurant business then you should think about partnering with Zomato to increase your customer base. Zomato business model depends on aggregating the existing restaurants on one platform. FSSAI has made it compulsory for all partner restaurants of Zomato to have FSSAI License for operating a food business in India. Strict actions are being taken by FSSAI against those who donâ€™t have FSSAI License. If you donâ€™t have a FSSAI license there is no need to panic. You can get your FSSAI License through LegalDocs online from the comfort of your home. You can click on this link â€œAdd a Restaurantâ€ where you will find a simple form. On this form you have to fill up details like Restaurant name, City, Are you the owner/manager, Restaurant phone number and opening status of restaurant. There is additional information to be filled up on this form like timing, serves alcohol or not, services, seating, payment but this information is optional. Zomato team will verify the details of the information filled and then restaurant will be listed on Zomato. Once your restaurant is listed, you can download zomato business app and start managing your business through this app. With the help of Zomato you can manage your online presence without owning a separate website. Zomato provides analytics option in Zomato business app to better analyze your business and make changes to operations to earn more profits. You can offer promos and deals in addition to zomato deals which boosts customer attraction to your restaurant. Online payment option is available for customers which makes it easier for them to order from your restaurant without any hassle. You can upload special menu directly from the zomato business app. Events happening in your establishment can be promoted through Zomato. You can answer reviews through Zomato business app and build credibility. Zomato is a highly recommended business partner to have if you are running a restaurant business.Get on with zomato to maintain your online presence and increase the reach of your customers.